Who thinks strictly black and gray phones are gloomy and boring? I do and, thankfully, so does Best Buy. A few months ago, the retailer announced an exclusive white EVO 4G, and today we got word of not 1 but 2 more white Android phones arriving on October 24: Verizon's Samsung Fascinate and AT&T's slightly outdated Sony Ericsson Xperia X10. While the exact pricing on either of these is unknown, you can head over to Best Buy today and reserve the device of your dreams with a $50 deposit. Unfortunately, there's no word on whether other outlets will be receiving these handsets - all we have to work with is the picture below. 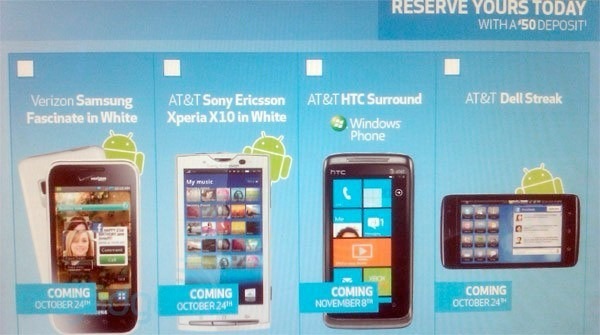 In related but not as interesting news, the same picture also reveals 2 more AT&T phones - a plain black Dell Streak on October 24th and an HTC Surround Windows Phone 7 on November 8th.